‘Cross primer: Get ready to race! Whether this is your first season racing or you’d like to freshen up your cyclocross skills, it’s a good idea to do some practice. Most of the clinics in the Portland area have wrapped up (the season gets underway this weekend); but you can grab some friends and head to a local park to do a clinic of your own. No, this isn’t a religiously sanctioned military campaign for cyclists to take over Portland. 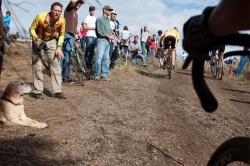 This is cyclocross. As fall approaches it’s time to start dreaming of the thrill of mud, cowbells, Belgium fries and waffles and hundreds of people cheering for you as you ride your way through cyclocross season. Whether you’re toying with testing the race field for the first time, or you’re heading back as a dedicated mud junkie, this is a simple guide to get — and keep — you rolling. gain confidence in patching tubes. Most folks don’t like to patch tubes for many reasons: “It takes too long,” “it never holds,” or “I just carry a new tube.” Carrying an extra tube will only get you through one flat per ride, and occasionally the new tube will fail. I’m always a fan of carrying a patch kit — and knowing how to use it can make the repair quick, easy and practically pain free. A standard patch kit comes with three things: a patch, some “glue,” and a small piece of emery cloth. All of these are of equal importance in the success of the patch holding. More on this—and pre-glued patches—later. 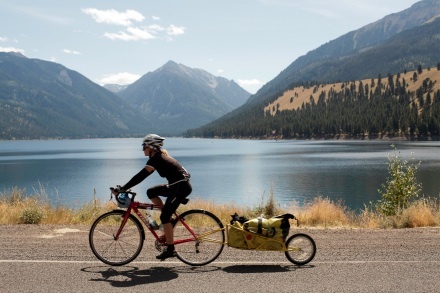 As I demonstrate, a road bike with a trailer can work on a multi-day tour (just make sure the gearing will get you up the hills). Make a clean sweep of grime. 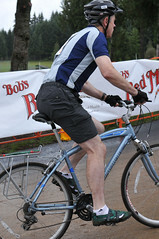 When you break it down, your bicycle only needs to do two things: Go and stop. In our last column we discussed the go (chains), today we’ll delve into the stop (brakes). Publisher’s note: This article was written by Tori Bortman. 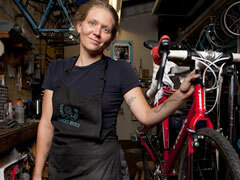 In the coming weeks, Tori will help you Optimize Your Ride by sharing her bike repair tips, tricks and perspectives. Lube it up, wipe it down. Choose a good lube. Look for one that’s not too thick or thin, preferably with a solvent mixed in. My favorite is A.T.B. Lube (which stands for Absolutely The Best). I’m a fan because I want maintenance on my bike to take as little time as possible. Go ahead. Call me lazy (I prefer “efficient”). This guest article was written by Tori Bortman, owner and operator of Gracie’s Wrench, which offers private and group bike maintenance clinics (and more). Tori wrote a similar article for us last spring, but this one’s new and improved! Thanks to El Nino, spring has officially sprung a bit early this year. Not that I’m complaining. More long weekend rides, less getting caught in torrential downpours — I’m all for it. 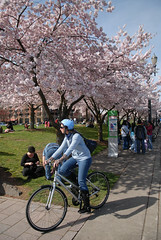 You may be ready for spring… but is your bike? 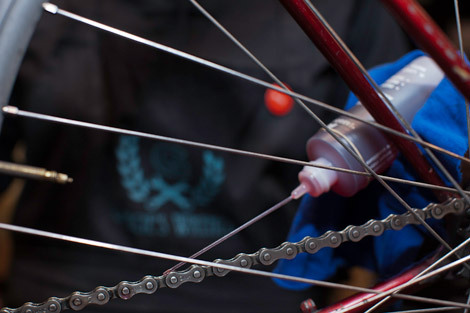 If you haven’t taken the time this winter to give your bicycle a thorough re-vamp, now is the time. That doesn’t mean you have to go running to the shop. Start slow and bring your steed back to life with some simple steps that will make your next ride practically dreamy. Editor’s Note: This article was written by guest author Tori Bortman. Tori is very active in the local bike scene. She’s a co-host of the KBOO Bike Show, a promoter of bike polo and women-only alleycats, and she’s the proprietor of her own bike mechanic training business, Gracie’s Wrench (which we reported about two years ago and was featured in The Oregonian this past Sunday). Today she shares a few tips about how to coax your battered bike (and psyche) out of the winter doldrums and into the sunshine ahead!